Customizable, flexible and no commitment. 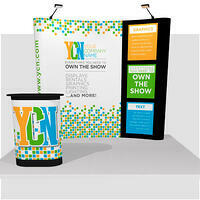 Just a professional looking trade show display. 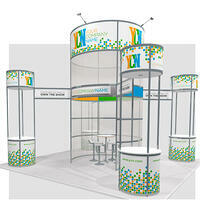 Companies choose to rent a trade show display instead of buying one for many reasons. 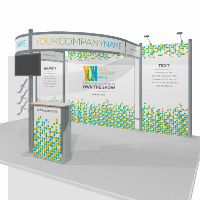 Whether you are a trade show newbie or a seasoned trade show pro, there are many factors to consider. Renting display hardware is approximately one-third of the cost of buying it; if you only need to use an exhibit once or twice, renting a display might be the way to go. 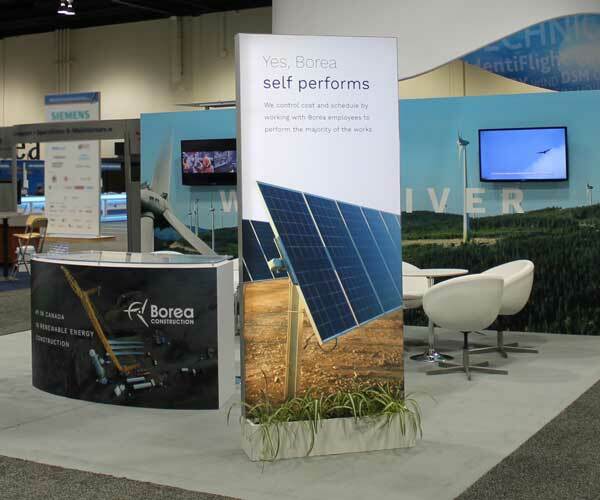 Rentals give exhibitors the opportunity to experiment with different types of displays, layouts, and booth sizes to figure out what works best before making the commitment to purchase. Consider logistics when deciding upon shipping your display cross-country. The cost of renting locally, in the city or town of the show, can be significantly less than shipping your existing display. If you have back-to-back or overlapping shows, renting a display may be the solution. If you're interested in renting a display for your next trade show or event, contact a sales representative for more information. 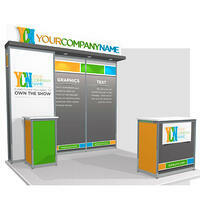 Considering a rental display but not sure what you're looking for? Some of our clients have used rental hardware, furniture and accessories in really creative ways! Have a look through our Rental Display Gallery for more inspiration. Hardware rental includes the frame, magnetic bars, (2) 150 watt spotlights, and shipping case. 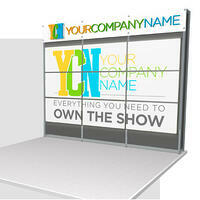 Choose from purchasing graphic panels, or renting fabric panels for use with new or existing Velcro-on graphics. The base rental package for the 10’ x 10’ Square display features a shallow ceiling (complete with three potlights) over a 3-panel graphic back wall, and includes a podium with internal storage shelf. The base rental package for the 10’ x 10’ Wing display features a curved overhead graphic with two lights, graphic back wall and curved counter with front graphic panel. 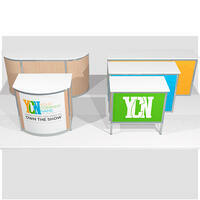 This package also includes a curved podium with internal storage shelf. 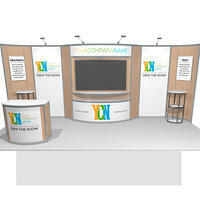 If you need a 20’ display for some events, and a 10’ for others, this is the option for you. The centre back wall (and header) fit a 10’ space, and utilize the same graphics as the 10’ x 20’ option—which includes back wall, curved header, podium, literature holders & lights. The base rental package for the 10’ x 20’ Wing display features curved overhead signage, a graphic back wall, curved counter, and four lights. 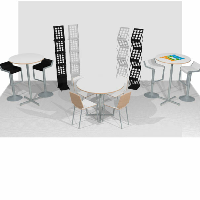 This package also includes a curved podium with internal storage shelf. This base rental package features a 16’ tall centre tower enclosed on three sides with frosted Plexiglas, meeting table with four bar stools, and four connected display towers featuring potlights and internal storage space. 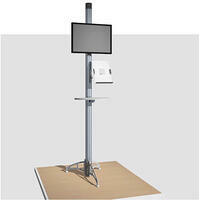 We rent a range of digital media, including monitors, mounting brackets and displays stands for those monitors. 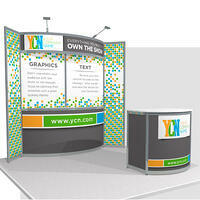 We have options available that can cater to your display needs. We rent video walls in configurations up to 16 screens. Each 42” monitor is HDMI, USB & VGA compatible. Available with or without back wall rental. A variety of different systems, styles and sizes. All available to rent without graphic purchase (white or black panels). We rent a variety of furniture and miscellaneous items, including single and double wide seats, and the table and chairs shown. Come take a walk through our showroom and see more options available. If you’re renting your display, you might not be familiar with the setup and take down. 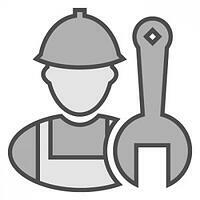 Our installation and dismantle team can handle it for you, leaving you free to focus on the trade show and everything in between.